Gardening wives’ tales, superstitions, myths, remedies, tricks, wisdoms, folklore, or whatever you want to call them—we hear them all the time and lots of people try them—but do they actually work? 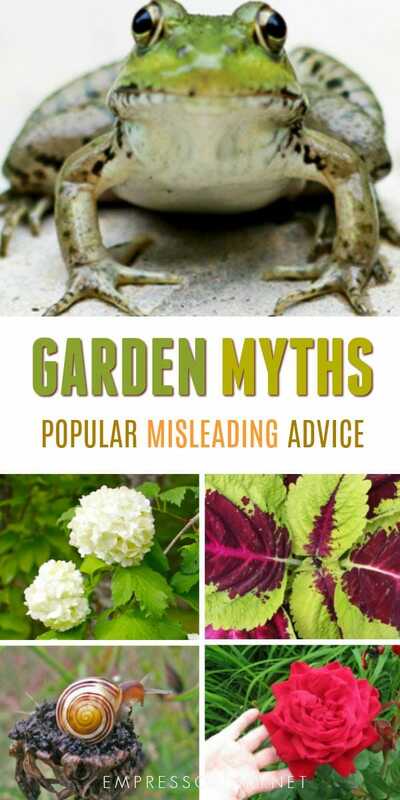 I”m not a scientist or a researcher but I like to make smart decisions with my garden and money so, when I hear these popular pieces of advice, I like to check the research to see if there is any evidience to support the claims. Many gardening wives’ tales originate when a crop is successful and, hoping for the same good fortune next time, we look for factors that may have contributed to the success. This has, of course, gone on throughout history, before we had scientific research to rely on, and continue today. Unfortunately, it’s far too easy to confuse correlation with cause. Just because your tomato crop flourished with Epsom salts or sugar in the soil doesn’t mean the salt or sugar caused your crop to flourish. And just because three crows squawked when you planted your awesome beans, doesn’t mean beans grow better when crows are squawking! My advice to new gardeners is this: ignore the wives’ tales and just start growing stuff. The garden is the best teacher and experience will bring you more success than a sprinkle of this, a dash of that, or waiting for a particular cycle of the moon to plant your seeds. Yes, I know, lots of people swear by that one and, while harmless, it might make your crop late by waiting for the desired planting time…. Wives tales vary greatly. They range from just plain funny or wasteful to good common sense substantiated by scientific research. But there’s also some that are actually harmful to plants, soil, and the environment, and that’s when it’s best to step back and reevaluate your choices. When I think I’ve found something unusual that works, and there are no indications that it could have harmful side effects, I like to try side-by-side tests (same conditions, same season, same seeds or plants). At least then I can compare tomatoes to tomatoes and see if I really have something to squawk about (or not). It’s not true scientific research, but it could save me some time and money to be more critical and analytical about results. As you’ll see, it’s not all black and white. Sometimes the remedy may work, but not for the reasons you think. Add Epsom salts to the soil for healthier plants and bigger tomatoes. See Are Epsom Salts Good for the Garden for more information. Bottom Line: No. The idea that Epsom salts are a magical tomato booster is a wives’ tale. Before adding any agents like this to your soil, you need a proper soil test. The test results will indicate any deficencies in your soil. From there, it’s important to learn what your options are and what affects they will have on not just the condition of your soil but the environment as well. The idea that Epsom salts act as some sort of magical fertlizer regardless of soil conditions is completely unfounded. The sweetness of a tomato is determined primarily by the type of tomato and photosynthesis. They cannot acquire sweetness from soil. Bottom Line: Save your baking soda for cleaning the house and the sugar for baking. Egg shells are great for enriching compost but take a long time to break down, and, it takes a diverse range of organic matter to form good growing soil. See Are Eggshells Good for the Garden to get the scoop. Bottom Line: Crush them into bits to help speed up the process, but don’t expect them to transform your garden. The idea behind using egg shells to deter slugs is the notion that slugs (and everything else) simply wants to take the easy route to dinner and climbing over sharp eggshells (or any other obstacle) is not easy. But. are you really going to put little bits of egg shells around every possible plant that the slugs might eat? Bottom Line: Save the egg shells (finely crushed) for the compost bin: there are other (though imperfect) ways to stop slugs. 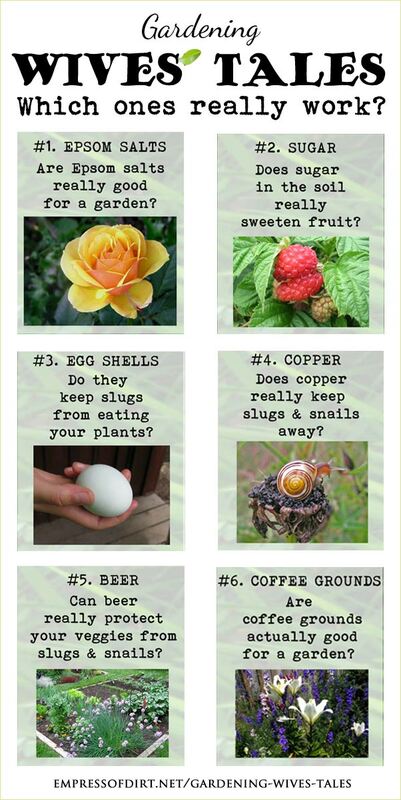 Pinterest has oodles of images of lovely penny-covered garden balls with descriptions claiming they repel slugs. Bottom Line: Think about it: even if there was truth to it, all it would be doing is sending the slugs away from the copper…and into your other plants for lunch! Best to try other approaches for catching slugs. Though, rock on with the garden art! And yes, most pennies don’t contain much or any copper. There’s no doubt that the yeast in beer attracts slugs, but you have to set up a trap properly so they fall in but can’t climb out. It’s also quite impractical (but not impossible) to keep the trap properly set up day after day with rainfall and other disruptions. Grapefruit rinds also attract the little beasts, and nothing beats a wooden board left out overnight on the damp soil for gathering a whole gang of them. Bottom Line: No matter how you attract the slugs, you probably have to get out there and finish the job by dropping them into a bucket of soapy water or feeding them to your hens. Nom nom. This is one of the few popular wives’ tales where I could actually find some evidence to substantiate it! Yes, coffee grounds are good for the garden but all the talk of changing the pH of the soil (it’s a complex topic and requires proper analysis) and miraculous growth spurts is really overstating it. See Is Coffee Good for the Garden for more details. Bottom Line: Coffee grounds provide beneficial nitrogen, some phosphorus and magnesium, but you need a variety of things for healthy compost and soil. Add your coffee grounds to the compost pile and keep it balanced with a mixture of other green and brown items. Are native plants the best choice for sustainable landscaping? Should you avoid disturbing the root ball when planting? Are organic products better or safer than synthetic ones? What is the best way to control weeds-fabric or mulch? Does giving vitamins to plants stimulate growth? Are compost teas effective in controlling diseases? When is the best time to water in hot weather? If you pay more, do you get a higher-quality plant? How can you differentiate good advice from bad advice? Myth #1: Pinch the seed pod off if the onion goes to seed to prevent bolting. Bottom Line: In modern hybrids, this actually prohibits the growth of the onion. Myth #2: Knock the tops of onions over to make larger bulbs. Bottom Line: This actually stops the bulbing process = no onions. Myth #3: To get sweeter tomatoes, add sugar to the planting hole. Bottom Line: Tomatoes get their sweetness through photosynthesis and genes (some types of tomatoes are sweeter than others): they cannot absorb it from soil. Myth #4: Plant peas and potatoes on St. Patrick’s day. Bottom Line: There are no specific calendar dates suited to all gardening zones: the best timing depends on your growing zone and soil warmth. Myth #5: Pinch blooms off annuals before planting. Bottom Line: Nope! All you get then is time to wait for new blooms to form. Myth #6: If a plant is under stress, it should be fed. Bottom Line: Fertilizer is not the answer for many plant stresses (compacted roots, poor drainage, overwatering, and so on). Determine the cause of the problem and then resolve it. Poor nutrition is often not the cause. Myth #7: Organic pesticides are less toxic than synthetic ones. Bottom Line: Organic, “natural”, and any other pesticides can be very powerful and harmful. You have to do your research with a reputable source and make careful choices. Plus, is really worth harming nature to try and “fix” the problem? Myth #8: Add sand to loosen heavy, clay soil. Bottom Line: Nope! It actually causes more problems. So does double digging. Been there, double digged that. Myth #9: Drought-tolerant plants don’t need to be watered. Bottom Line: They’re tolerant, not dead! Yes, they need water. Myth #10: Citrus peel repels ants. Bottom Line: Meh. Does not make the ants go marching away. Myth #11: When planting a new tree or shrub replace the soil in the planting hole with organic material such as compost. Bottom Line: The tree will do better if you reuse the soil you removed from the hole. Myth #12: Organic material – especially compost – is always good. Bottom Line: Consider the source. Municipal compost can contain pesticides and other toxins. Got one you follow, find funny, or debunked? Leave it in the comments! Common Garden Pests and Their Natural Controls | Remedies for dozens of pests. 48 Smart Money-Saving Garden Ideas | More preventative measures to thwart pests. I have had amazing results in transforming the top couple of inches of clay by dumping a layer of unwashed seaweed on top of the clay and then walking away for a couple of months. When I return and lift what’s left of the seaweed…there will be a couple of inches of black dirt underneath. I guess the seaweed fosters some sort of natural biological transformation, I’m just not sure what, just that it is a wonderfood for soil. On adding epsom salts: If large scale farmers use it to solve a deficiency why shouldn’t home gardeners? I have used it and have recommended it to other home gardeners who found it miraculously helped vining plants especially..
Hi Cordell, My understanding from the research available is, first there needs to be a proven magnesium deficiency for the salts to ever be warranted. Then, we need to weigh the environmental cost of using them (this can be quite serious and comes down to a business weighing the costs and long-range effects). Many home gardeners never have their soil tested to know if there is an actual deficiency. Using Epsom salts without proven need may very well be an unnecessary expense and introduces these salts into our soil and waterways where they are not beneficial. I’m always open to hear about new studies that may show otherwise. Mass agriculture methods deplete soil nutrients including magnesium. Home gardens rarely show this and should have soil tests to confirm any deficiencies. On double digging having no value. If you dig in a heavy growth, e.g. a cover crop, it will loosen the soil. I’ve found it only helps temporarily unless so much cover crop (or compost or whatever) is introduced that you’re essentially replacing the top 6-10 inches of soil. There’s a lot of interesting studies on soil life and health and the ill-effects of heavy turning of soil, or more specifically, the benefits of disturbing the layers as little as possible. Loved your blog. It’s wonderful to see sensible garden advice for a change! I use copper sticky tape around my pots and raised beds. It keeps the snails & slugs away from the plants. It has worked for several years. I’ve had good luck with DE keeping earwigs off the lettuce. Just like Sluggo, you need to reapply it. Make sure to get “food grade” and not the stuff for pools. I find that planting in the same soil and outside conditions in which the plant will live makes for heartier plants. I direct sow nearly everything. We have a compost heap but I’m concerned about putting certain items on it. We have several choke cherry trees that we want to cut down. I read that the leaves and seeds are poisonous. Will the leaves and seeds leach the poison into the compost and make it unusable for a vegetable garden? What about the pits from the plums or other fruits whose seeds or pits are toxic? Hi Helen, the answer is longer than I can provide here but yes, there are some items that are best kept in yard waste, not a compost pile that will eventually be added as humus to a food garden. YES! On planting new trees. I always thought that a slow grower like a tree would benefit from being put in What It’s Actually Gonna GROW in, than putting a bunch of compost in and then ‘shocking’ it later, once the roots grow thru the compost! I did it ONE time, and the noticed the tree faultering. Never again. Thank you for the great articles, can’t wait for spring here in central BC -22 this morning. I enjoy your newsletter very much and get a chuckle every once again, like with your garden naming – mine Cucumber von Watering Can, I love it. Going to make a garden sign with my new garden name. Keep up the good work, can’t wait to get into the soil. Happy gardening. Living in north Texas I certainly have clay issues. After killing several plants, I asked someone at a local nursery what I should do. I always mix the clay (that I dig out of the hole/flower bed) with a rich top soil. Then, in the top six inches of the soil around the plant/tree/shrub, etc…..I add expanded shale. It keeps moisture in, or moisture out, and strengthens the root system. I haven’t had an issue planting since. Melissa, you have outdone yourself again! 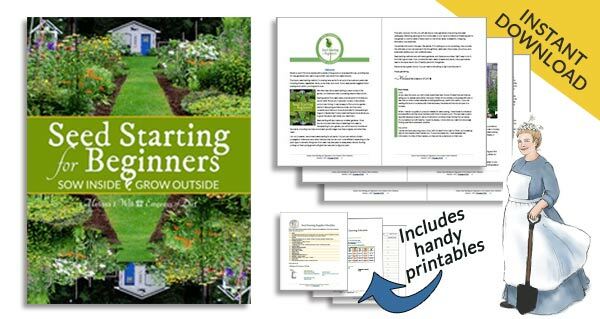 This post will be serving me well as I am planning my first veggie garden…Thank you! Thank you Judy. I’m sure you will have a wonderful time with the new veg garden. I have no experience with the dog hair method but my best rabbit remedy has been raised beds. A farmer told me rabbits won’t jump where they can’t see, and if the side of the raised bed is higher than them, they won’t climb in for lunch. Definitely worked at my last garden where we had a huge rabbit population. When applying any remedy to the garden, I always ask, what is it I’m trying to accomplish and why? What will happen if I don’t take action? And, what harm might it cause if I do? I have not read enough about DE give an opinion. I just never have the desire to use things like that. When I have a problem in the garden, I look at why the imbalance occured and if there’s other things I can do to help resolve it (such as moving plants or removing ones that attract invasive pests year after year). We all have a crazy combination of native and non-native plants in our gardens, along with the same array of insects and pests, and gradually things sort themselves out. Perhaps I’m just very tolerant, but I’m very reluctant to ever apply something that could harm the beneficial stuff too. After all, it’s just a home garden -my welfare does not depend on it. I too have had great success by building up garden beds on top of clay. As a young gardener I tried to alter the clay, but eventually saw that it’s a losing battle. Basically the clay returns to its old self and pushes the integrated compost or sand up and out. Much better to layer on top as you said. WOW! Thank you so much for searching and sharing this stuff! Whoda thunk it?! I wonder now about the DE I’ve started circling certain plants with. Does that work? Seems to me like it ought to. peat moss. I started them four or five years ago and have been thrilled with the results. I’ll stop the crushed egg shells and pennies though.. and beer traps. I’m situated on solid rock so I tried the Lasagna garden suggestion. What a blast! Ten years now and the plants (all local) take care of themselves and have grown to enormous size. Healthy and prolific…I don’t need to fertilize either.